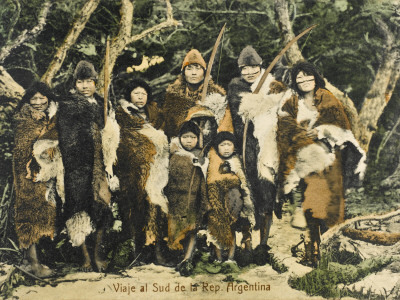 Patagonian Giants, the Ona Tribe. 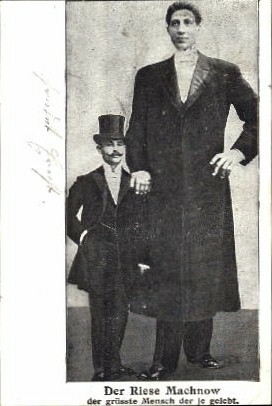 Dr Frederick Cook’s photos, and notes: 7 foot giants. 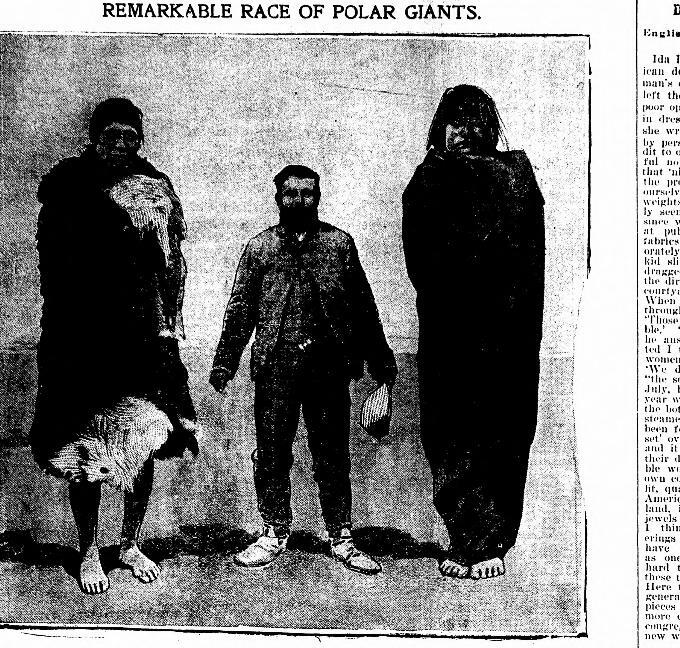 Dr Frederick Cook, the controversial explorer and physician made some interesting claims of having encountered “giants” among the “Ona” people of Patagonia during his “Belgica” expedition in 1896-97. His photographs and notes which I recently discovered in online publications, I feel, might offer some explanation to the endless stories of giants in that part of the world — that actual tribes averaging six feet tall for men, with some individuals 6-1/2 and even 7-1/2 feet tall–indeed existed. 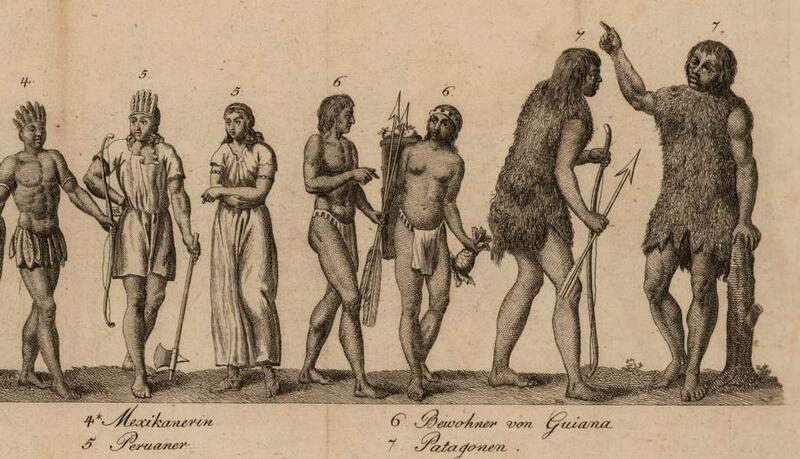 Stories of 7 to 12 foot tall Patagonian giants had been circulating for 500 years. 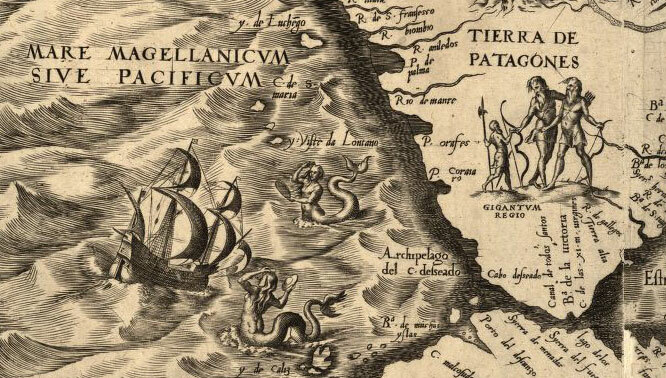 They were commonly accepted, and portrayed on maps, and in atlases and books of the day. Amerikaner Leipzig 1796. 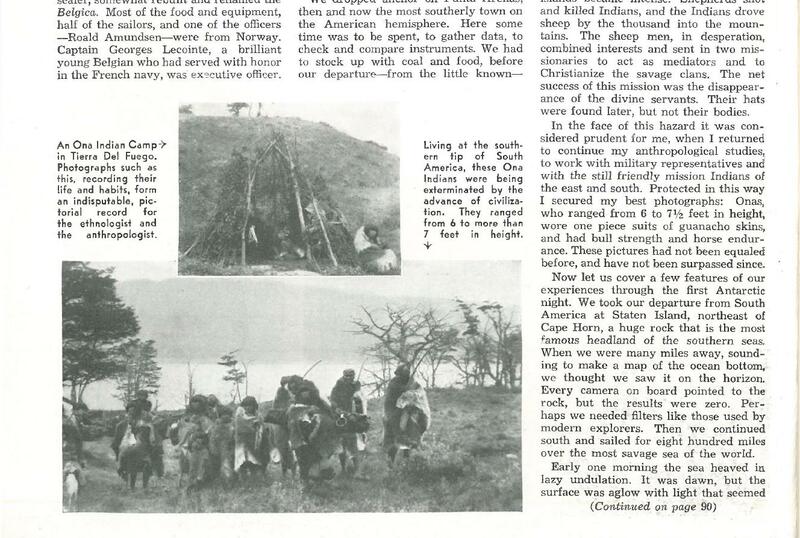 I later found a February 1938 interview in “Popular Photography” Magazine, with Dr. Frederick Cook, and in this interview he claimed the Ona tribe he met in 1897 were from “6 to 7-1/2 feet tall” , wore animal skins, had “horse endurance” and “Bull’s strength” and lived in simple wigwam huts made of tree branches. One of the amazing photographs he took featured a man 7 feet 2 inches tall, and another of a woman 6 feet 6 inches in height. Ona man 7 ft 2, Dr Cook – Popular Photography, Feb. 1938. Fuegian, 1840 – Tierra Del Fuego, Chile. So “wild”, and intimidating a people to the early Europeans, could the fabled stories of giants, or even wild hairy men, be in part, based upon such encounters with these strange, but terribly misunderstood, and now exterminated indigenous tribes? Perhaps. We have some legends among Indigenous persons in North America regarding the cannibal red headed giants, in addition to some historical accounts of the tall and powerful Karankawa, also alleged cannibals. I think these fierce and powerful types may have left a lasting impression on neighboring tribes, and later European colonists — that they became the “bogey men”, and wild giants — the stuff of fairy tales. We need to remember, the average height of the Spanish, English, and early Navigators of the 16th to 18th century was about 5 feet 5 or 5 ft 6 inches tall, and that was almost a head shorter than the “Tehuelche” tribe of Patagonia, who averaged about 6 feet for men, and some even 6 feet 6 in. 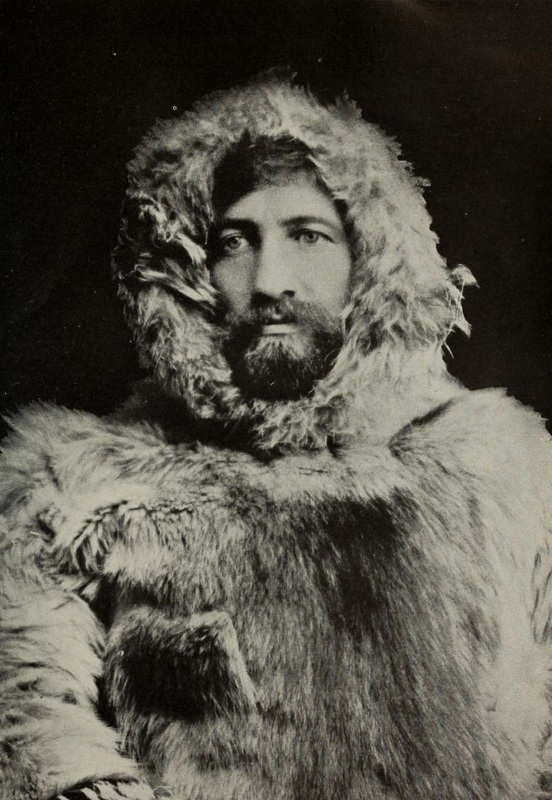 (See Documentary: https://www.youtube.com/watch?v=7ehIfTIdfXs) And now, with the revelation of Dr. Frederick Cook’s notes, there is yet more evidence of some individuals up to 7 ft 4 among the Selknam, Ona tribe, existing right up into the turn of the century. 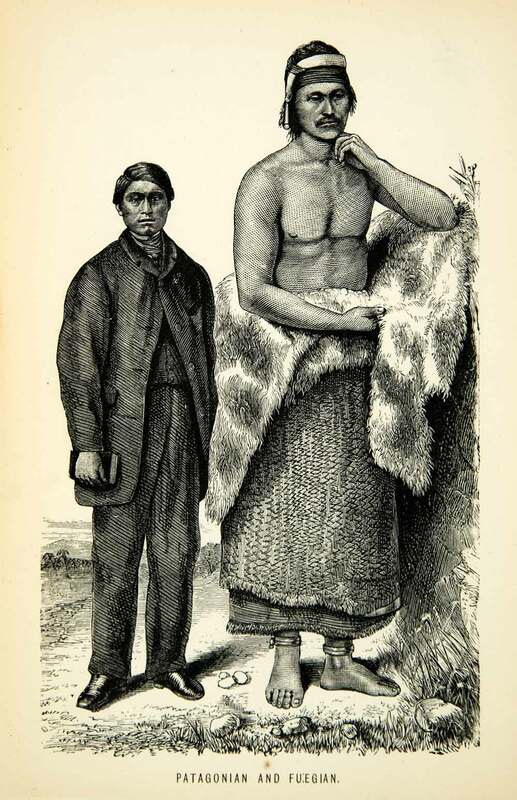 Patagonian and Fuegan 1871 Wood engraving. Large skeleton from Oahe Reservoir, Leavitt site. The photo caption in this Smithsonian bulletin lists the marker as 1 foot. I believe it may in fact represent 27 cm – (5 bars of 5 cm, and 1 additional centimeter at the ends of the stick). Comparing this scale marker to the size of the femur, it would suggest a femur approx. 24 – 26 inches long. The skeleton may have been of a man from 7 to 8 feet tall — assuming this marker is indeed at least 27 cm long. 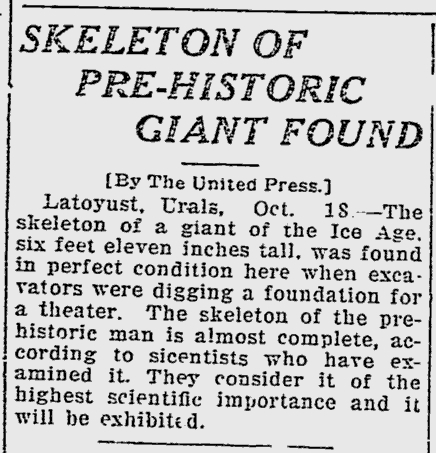 They have been finding scores of amazing and interesting newspaper articles on giant skeleton finds, and other bizarre reports in the archives! Estimating stature of giants from long bones, femur and tibia lengths will often severely under-estimate actual stature using the standard anthropological regression models for tibia, femur — inaccurate for tall or very tall persons, routinely underestimating stature by 6 inches to more than 12 inches!!! However, it becomes increasingly inaccurate the shorter or taller you are from the mean, or normal range!!! That is to say, if you are less than 5 feet tall, or more than 6 feet tall. 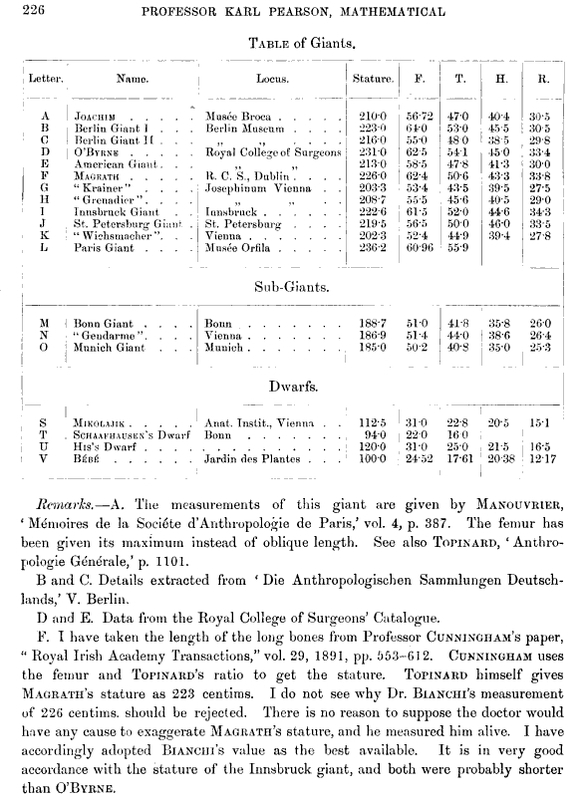 Below is a list of 12 different historic and pathological human giants who are from 7 to 8 feet tall and whose bones were housed in museums in the 1890’s, and the dimensions of their long bones listed. The average ratio of femur length to stature of the giant is 1 to 3.73, the femur representing about 27% of living stature. 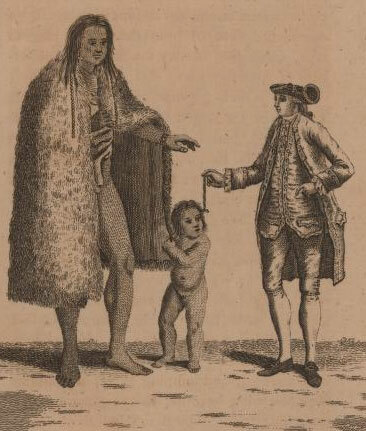 Using the overly simplistic regression formula such as Trotter and Glesser and Fordisc 2.0, we find that the femurs on the skeleton of the 7 ft 7+ inch 18th century Irish Giant Charles Byrne which measure 62.5 cm (24.6 inches) would erroneously suggest a living stature of only 6 ft 8 to 6 ft 11 inches tall, or fully 8 to 11 inches less than his actual stature!!!!! Similarly, the Guinness Book of World Records 1990 listed the estimated length of Robert Wadlow’s femur as 29.5 inches (75 cm). Wadlow stood 8 ft 11.1 inches tall in life. Using the Trotter and Glesser or Fordisc 2.0 method, Wadlow should have been only 7 feet 10-1/3 inches tall! – or nearly 13 inches shorter than his actual height of almost 9 feet! So it becomes rather obvious, that even pathological human giants tend to conform to the same basic proportions as people of normal stature, with some occasional exceptions. But by and large the femur to height ratio generally is from 1: 3.5 to 1:4 in , or 1:3.7 being the general average for males. The ratio tends to be higher in women than in men. But the general rule of thumb, is that if a femur length is given of any individual, I multiply it by 3.6 or 3.7 to find the approximate conservative estimate of stature. it works very well most of the time for me. 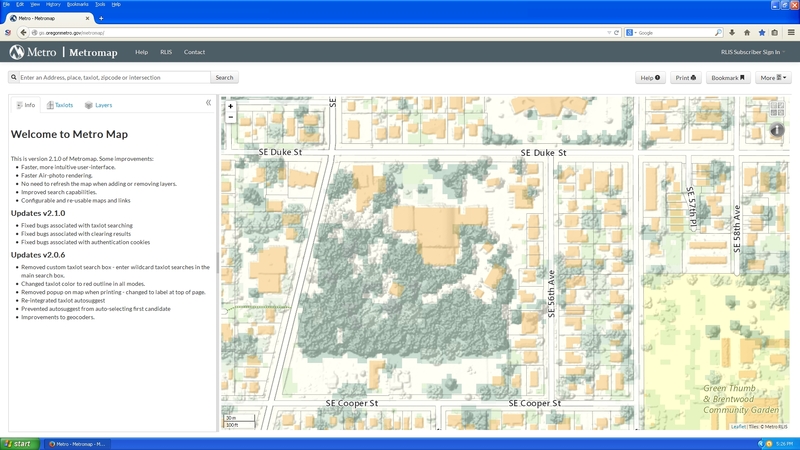 Metro Region has an interesting feature on their website’s GIS mapping portal. 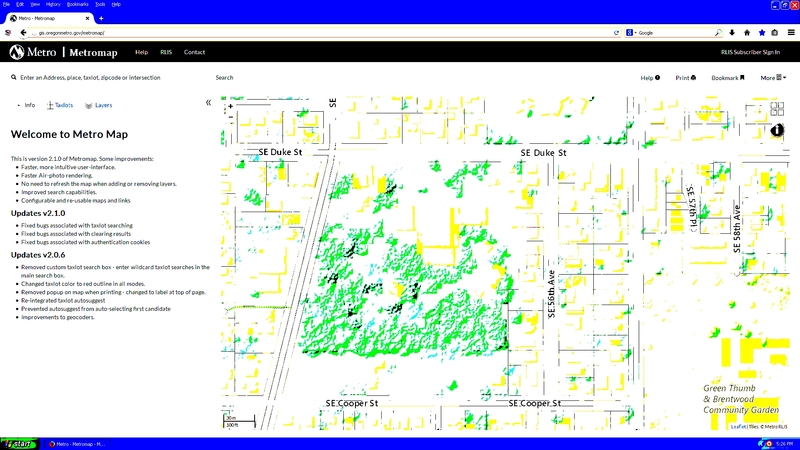 What appears to be LiDar, or some sort of topographical feature overlay with building footprints and tree impressions, are modeled in their BASE RLIS layer map. Using this as a basis, I have found a new method of weeding out clusters of tall trees in their respective groves / stands. 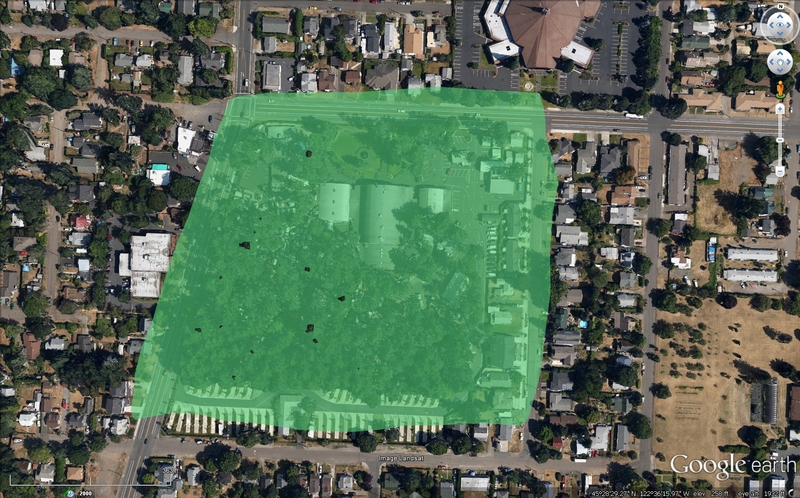 Here is the same location using the Google Earth 3-D Photo-realistic mode, after I applied a polygon canopy filter of 38 meters – or, 125 feet, to find the tallest trees. The 2 map layers do seem agree rather well with each other. I will test this method for future projects in the metro region to find new tall tree records. Update: 01/07/2015. 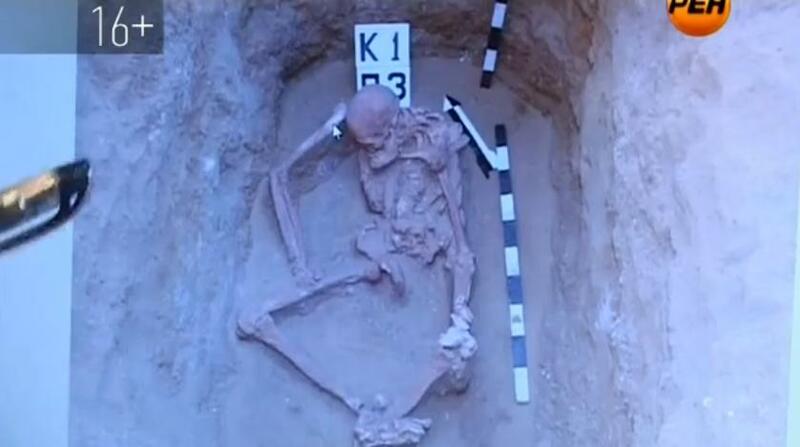 More 2-meter tall skeletons unearthed in Kazakhstan, and Russia in the past few months! 2 meter+ skeleton (Over 6 ft 7 in. tall) Kurgan giant warrior 2012, Kumsai, Kazakhstan. Note 1 meter stick! “Sergey Bogdanov. – Despite the fact that the burial rite and anthropological features is undoubtedly the population happens to the Caucasus, such sites have not yet met. 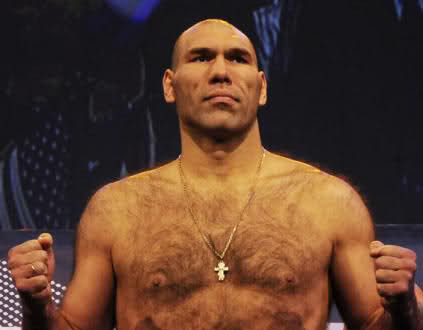 Most representatives of the pit culture – quite strong people taller than 180 cm. This is not the limit. According to archaeologists, come across some individuals whose growth exceeds and two-meter mark. 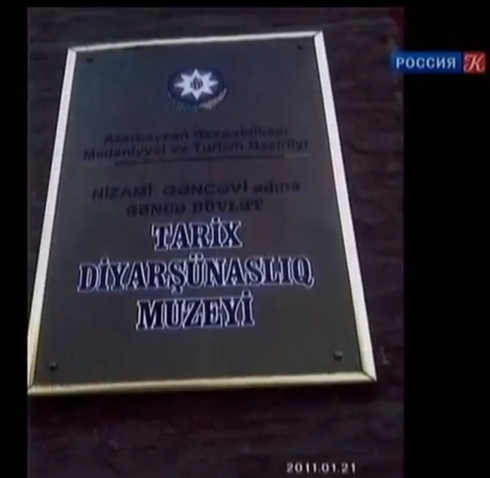 Source of attached photos: https://www.youtube.com/watch?v=0RclE6OreGA at 10:15 into the video, interview with archaeologist Aslan Mamedov on the finds. 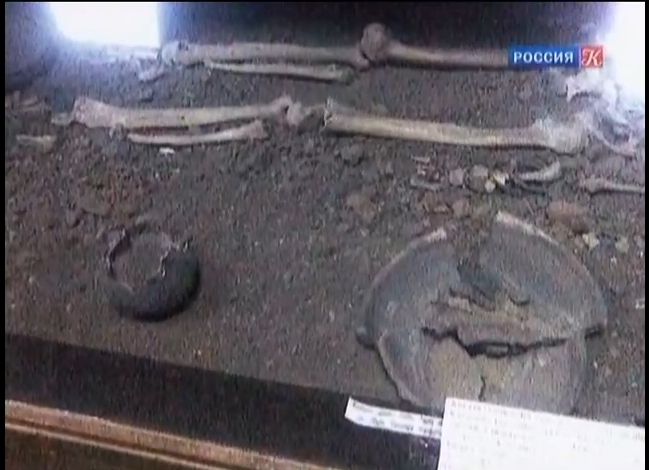 The remains of the ancient “people-giants” found in the Kuban region in Novopokrovskiy. Local “rural newspaper” published photos from the excavation site. 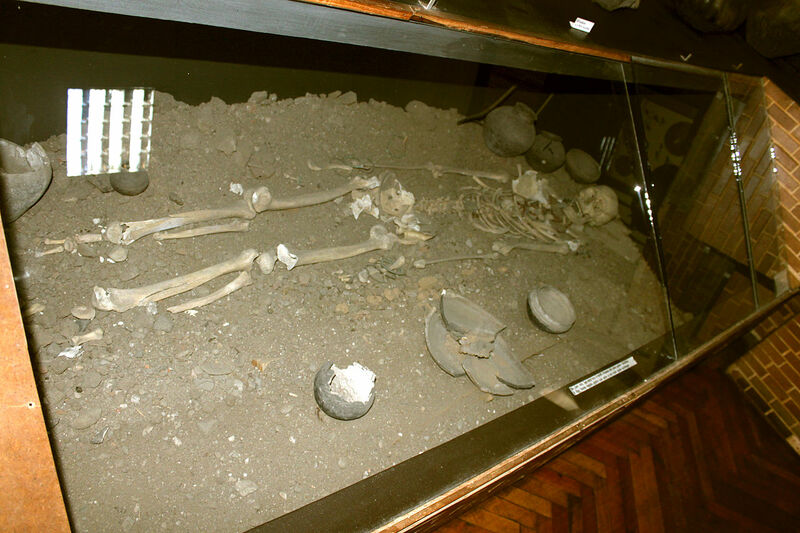 Employee of the Archaeological Society of Kuban Vasily Mataev told “Interfax” that the increase in the burial of men was about two meters. 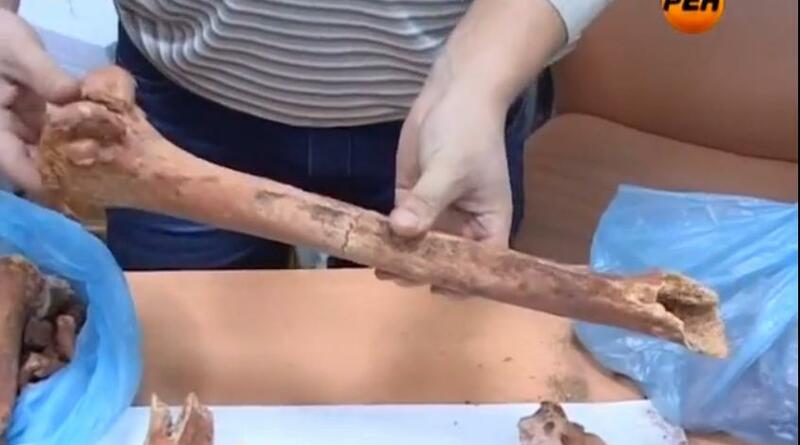 The discovery was made during excavations near the village of Novopokrovsky, near the village of sugar factories. 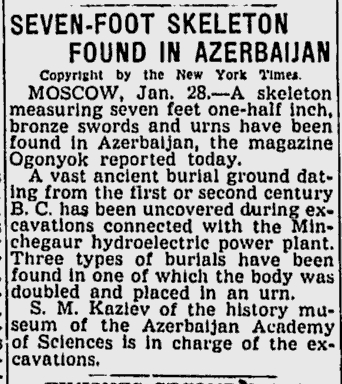 “Rural newspaper” claims that the giant skeletons found by chance – in the conduct of work on the installation of high-voltage power lines. 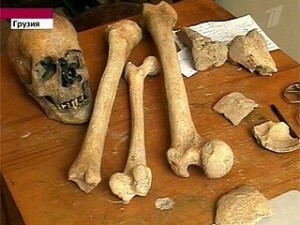 Mataev assures that the skeletons unearthed in the ancient mound. TV channel RTR combines its communication both versions: excavations were at the construction site transmission lines, but the researchers examined this area deliberately, even before construction began. “This is the second half of the III millennium BC. Found four people – two men and two women. In fact, men are quite high, strong, their growth – about two meters. Women are also quite tall – not less than 1.7 m,” – said the scientist. 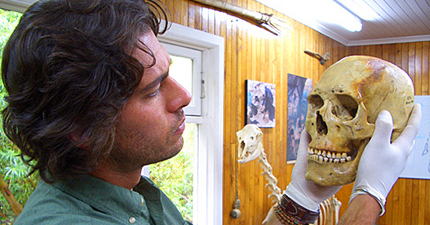 According to him, the approximate age of the finds is more than 4000 years. In those days, in the 25th century BC, this place was inhabited by tribes of nomadic farmers, the culture of which there are only fragmentary information. 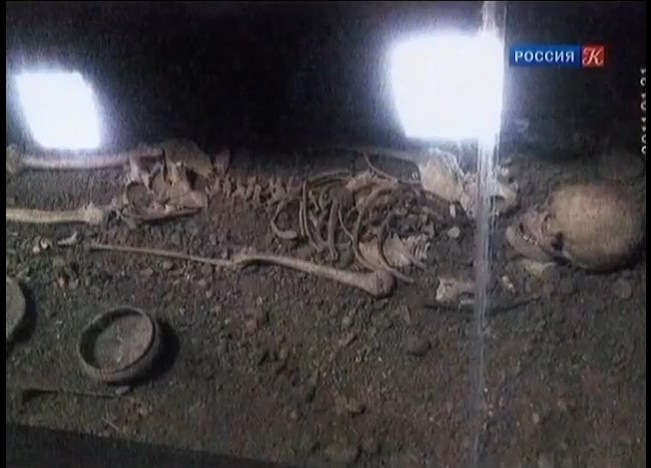 In the area of the village Novopokrovsky also found deep underground, where human remains were placed. At the same time, scientists have not found in the ancient burial ground of any other artifacts or objects of material culture. There are a surprising number of reports pertaining to ancient “Mound builders” of gigantic stature being unearthed from the Ohio Valley, but another concentration of Mound giants also occurs among the Kurgans of the ancient steppes of Russia, Central Asia and the Caucasus mountains. Skeletons of startling proportions, giant chieftains and warriors– men and women 6-1/2, to 7-1/2 feet tall have been unearthed in burial mounds 5,000 to 3,000 years old in the Don Region of Russia, Zaporozhye, Ukraine, as well as Georgia, Azerbaijan, and Kazakhstan within the past decade! first – on uninhabited wild pitch and a second – that ancient people were significantly lower growth than contemporaries. And another unusual factor: the tomb guarded by two talisman. …There are no skeleton men hand and foot. And instead of a face – a clay mask. Archaeologists say that the relatives did not find all the pieces of the body of the victim, because his head was restored with clay. Growth of women – 180 centimeters. At the same time, experts say, the growth in neighboring mounds of dead reached 210 centimeters. Entrance to the tomb guarded plate with an inscription and two anthropomorphic sculptures. 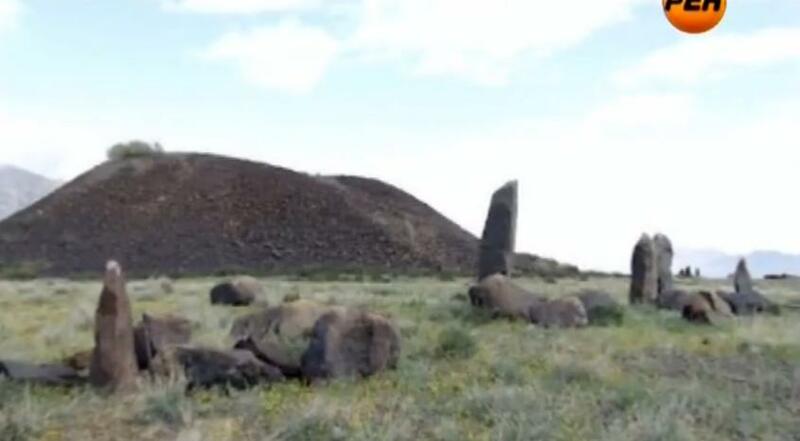 …In Khakassia like Mounds have been found long ago and not a single copy. In Minusinskom museum named Martyanova kept the skull belonged to a man whose growth also was 210 centimeters. He was buried also in a very solid mound. And the famous Valley of the Kings at Abakan Salbyksky mound is a puzzle for scientists. Still not been established who and when erected megalithic structures. The Southeast Missourian – Oct 18, 1927 pg 7. 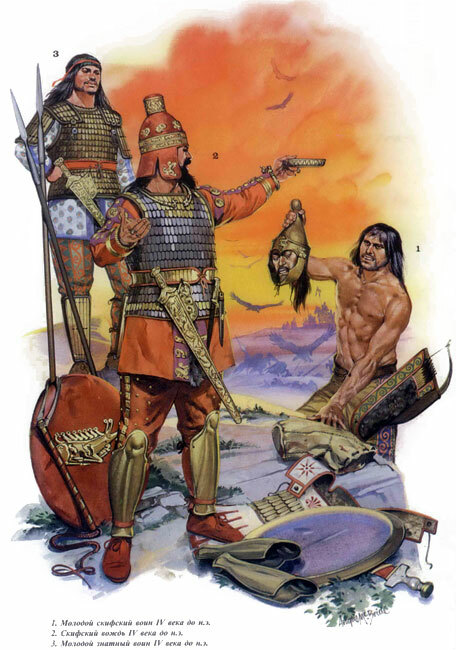 An Amazonian Giantess – A Warrior Princess of the Caucasus. The Spokesman-Review – Jan 29, 1947 pg 17. -Update – Feb.21, 2018. Confrimation of Mingachevir Giants. – Update 2. February 21st, 2018. 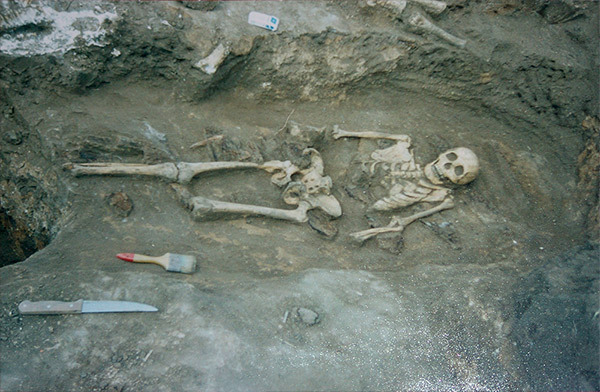 Another 7 ft 3 Woman’s skeleton, Azerbaijan! 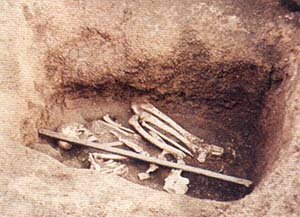 A National Geographic affiliate Paul Salopek has written an 2015 article on the discovery of two very tall Medieval skeletons from the remote village of Kis, in Azerbaijan. Did Vikings Really Hail From the Craggy Caucasus? 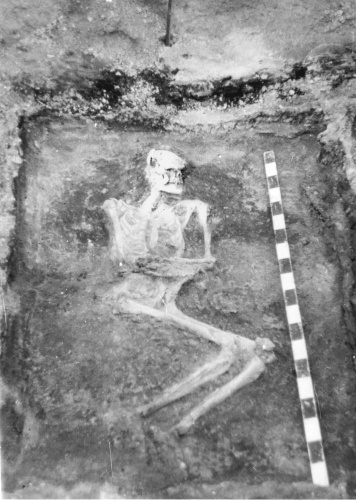 Evidence of long-boned Vikings? Crypts at Kis contain some very tall medieval people. One man at least six-foot-six. A woman was seven-two. Photograph by Paul Salopek. A 12th Century Giantess From Poland. 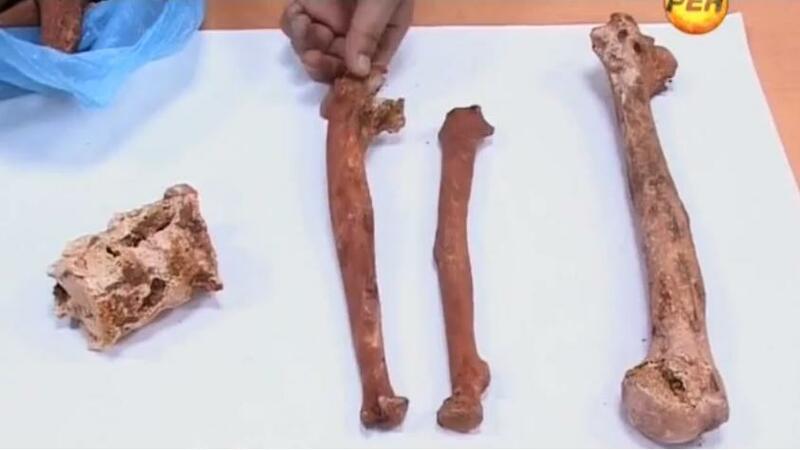 Borjomi Giant leg bones, compared to normal human femur. 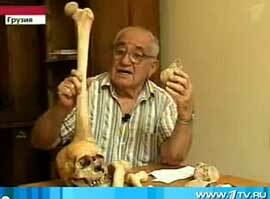 Prof. Vekua holds up a large femur of the giant man. The Deseret News – Mar 29, 1976 pg 4. 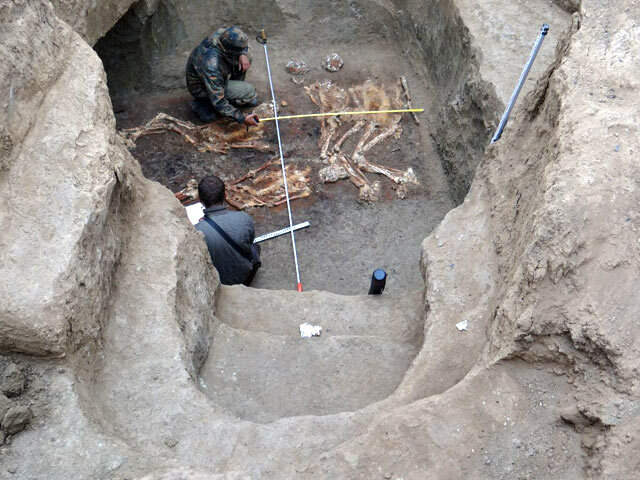 Kazakh archaeological expedition has found a burial place aged about three thousand years during excavation of a burial mound near Lisakovsk town in Kostanay oblast in Kazakhstan, Tengrinews.kz reports. Three Bronze Age stone vaults were found by the archaeologists. 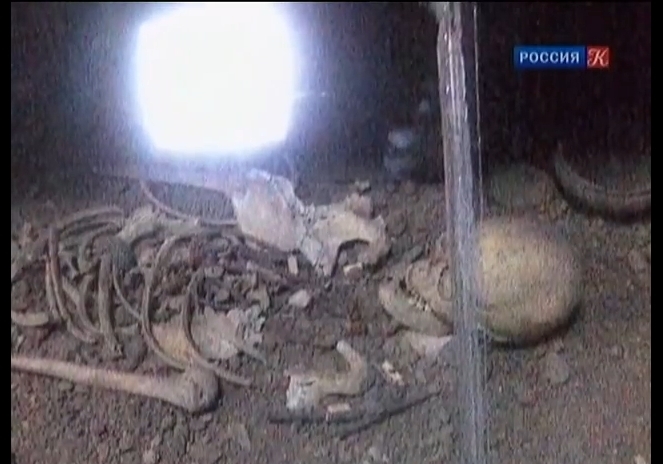 The experts were amazed by the two-meter man skeleton that was found in one of the vaults. 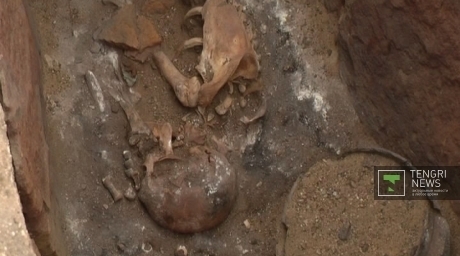 The archaeologists said that the remains must have belonged to a tribe chieftain. “This is a unique founding in terms of society differentiation. This will help us to understand what was the attitude to a person was vested with a “chieftain” authority. The other two vaults had been robbed. 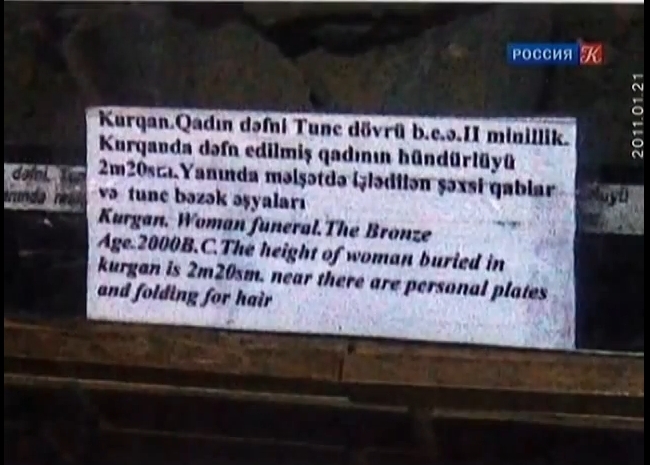 They were women burials. It was permitted to enter them and to take different adornments from them. 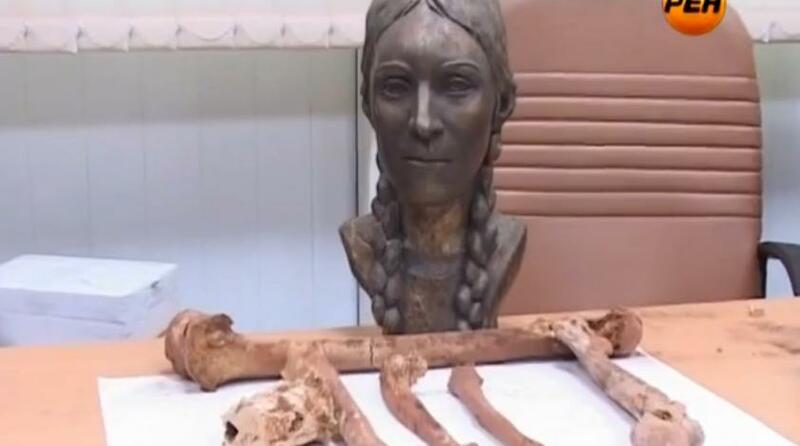 Everything could be taken from there, but it was forbidden to enter the chieftain’s tomb,” Emma Usmanova, the archaeological expedition head said. 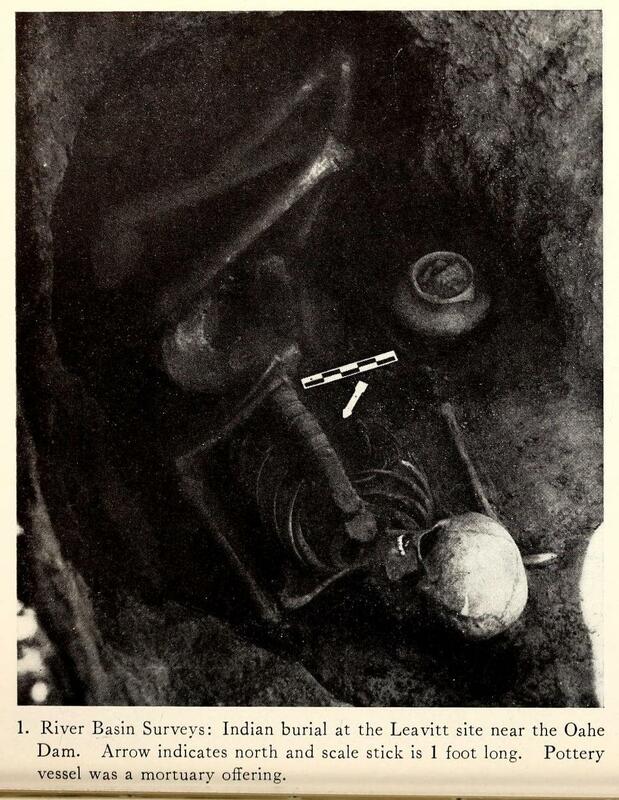 Pottery and food were neatly set next to the chieftain’s skeleton. “It won’t be possible to restore his hairdo, but the main appearance could be restored. It is obvious that the man had strong muscles. Places of attachment of muscular tissue are well pronounced on the skeleton, and there are big rough mamelons on his bones. 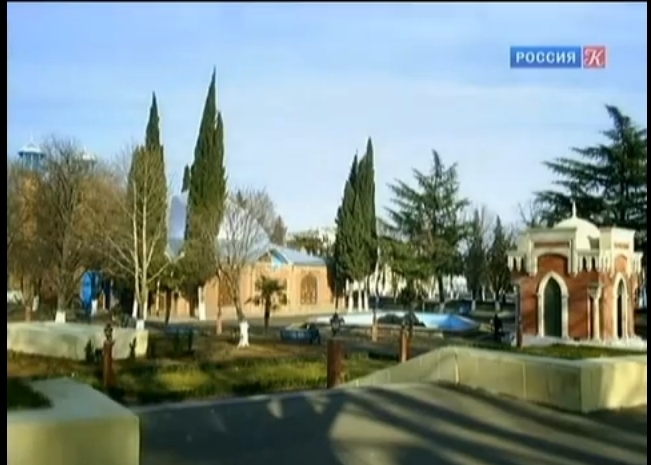 This means that the man’s physical build was very strong”, Aleksey Ovsyannikov, the participant of the expedition and the head of Karaganda oblast forensic division said. As soon as it stops raining, the archaeological expedition will continue the excavation at the burial place. NOTE: A Similar giant reported in 2002, found in Kazakhstan. 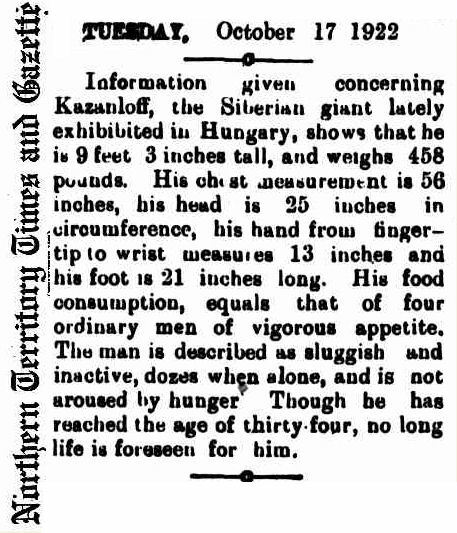 An intriguing account from 1901 of an 11 foot skeleton from Russia. Specific details are lacking. – Republican Watchman, Monticello, N.Y. Dec. 13, 1901. 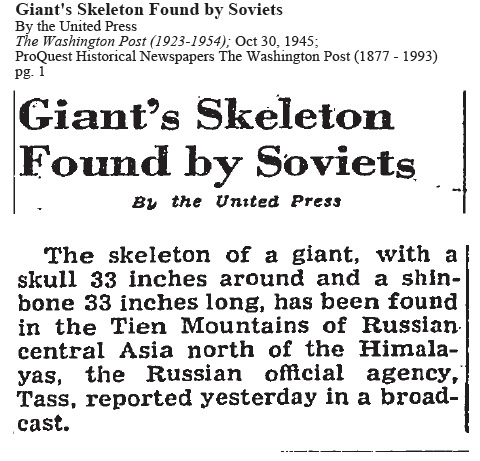 The Washington Post, Oct 30, 1945 pg 1. – Note: If the size of these bones are accurate, they would indicate a human giant 11 to 12 feet tall if proportionate. Fyodor Andreevich Makhnov, 1878 – 1912. Born in Kostyuks, Ukraine. Stood 2 meters 39 cm, 7 feet 10 inches. Timofei Bakulin, 1894 -1936 of the Terek Cossack host, born near Voronezh, Russia. Stood 2 m 40 cm, or about 8 feet tall! 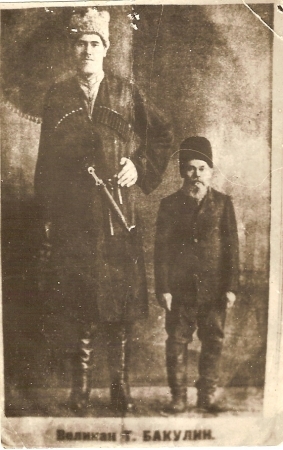 Ivan Stepanovich Loushkin, The Giant Kalmyk – 8 feet tall. Ivan Loushkin (1811-1844) was an acromegalic giant, and drum major of the Imperial Russian Preobrajenskey regiment. Castings made of his long bones were sent to the Orfila museum, Paris as well as a casting of his hands and feet. His ancestry was from the Kalmyk people, from the Northern Caucasus mountains – related to the Asiatic peoples of Mongolia. His femur was 666 millimeters in length (26.22 inches), and tibia 582 millimeters (22.91 inches). Total stature has been estimated at 2540 mm. or 8 feet 4 inches, in this 1879 paper: Annali universali di medicina e chirurgia, Volume 249, 1879 – pg 76 and 77. Others have attributed a lower stature of 7 ft 10-1/4, or 239.4 cm, but taking the lowest and highest of estimates based off his femur and tibias, he was an approximately 8 feet tall giant. 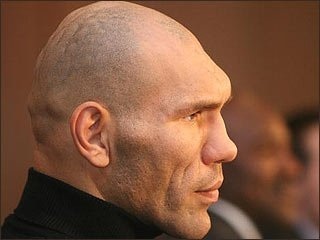 Mr. Valuev exhibits rare cranial features characteristic of the robust Upper Paleolithic era. 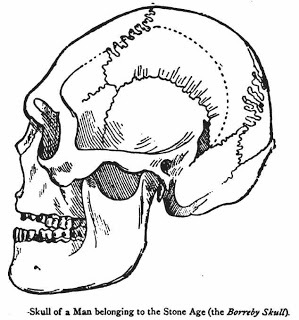 Similar massive skulls have been reported in North American burial mounds, as well as those in Asia and Europe. 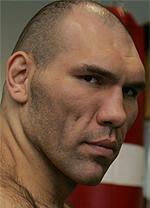 A Modern Kurgan Giant? Atavistic throwback, or unique genetics? In any event, Acromegalic gigantism can be a genetic mutation passed on in recessive genes, and families for hundred, indeed even thousands of years. (See New England Journal of Medicine 2011, Charles Byrne study Standing tall: The 1,500-year-old mutant giant gene that is STILL causing excessive growth in Northern Ireland). 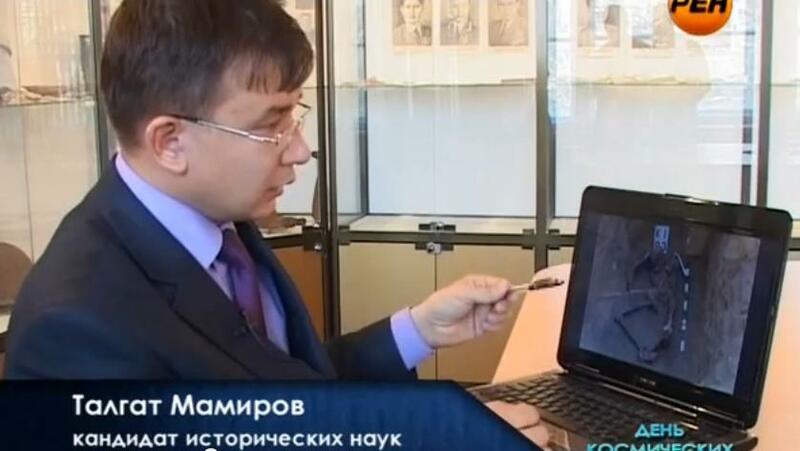 Almost 10 years ago in one of the museums in Siberia, I drew attention to the unusual skull. The inscription underneath reads that the artifact belongs to the man of the Bronze Age. His height was about 210 centimeters. Ordinary people of that era did not exceed 160 centimeters. Skull was found in a burial mound was near Minusinsk depression, which was one of the centers of civilization, which some researchers attribute to the Aryan. In fact universally ancient sources say that in the world, at the stage of development of modern civilization, people lived close to the Giants – “of old men of renown.” But the traces of their alleged no scientist has found. Although, if you look to the naked eye on the gigantic buildings, scattered around the world, it becomes clear that people could not build it. Esoterica of all stripes napridumyvali tales about the three-meter and even nine-meter giant skeletons or skulls that nobody has ever found. Also, none of them was able to make the elemental analysis of ancient texts, which clearly indicated that, in modern parlance, man was created by genetic engineering in the “image and likeness” of those “good people since ancient times,” which were taller than a man. Half a meter in height advantage, “immortality” and over developed brain did these human ancestors real deities. Over time, they disappeared as a separate species, for unknown reasons not yet fully, but traces of them still remain. 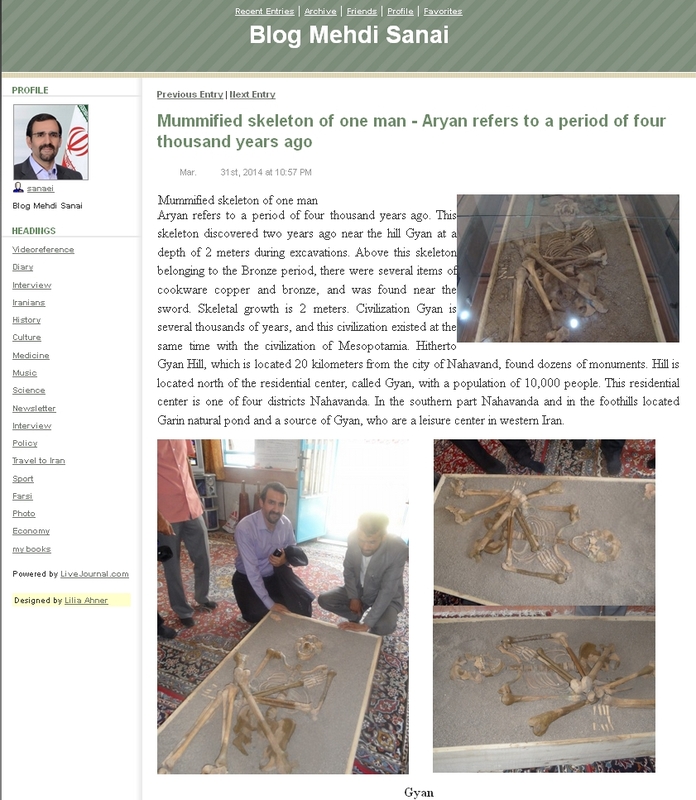 Artifact discovered two years ago near the hill Gyan at a depth of 2 meters during excavations. “Over this skeleton belonging to the Bronze Age, there were several items of utensils made of copper and bronze, and was found near the sword. Skeletal growth is 2 meters. Civilization Gyan is several thousands of years, and this civilization existed in the same time with the civilization of Mesopotamia, “- said the ambassador. 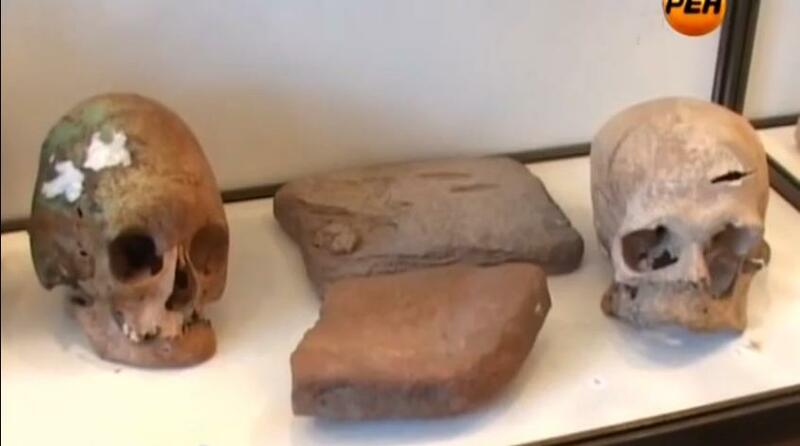 Thus, at least two real artifact found in thousands of miles apart, but belong to the same culture, the need to make science, at the end of the day, review some of its dogmas, which still gives the right to life tenet of Darwin’s theory of human origins . Although the scientists stressed that he only put forward the hypothesis that, in his opinion, was to give impetus to the search for truth. PS Lately, many of my thoughts about the antediluvian era and post-Flood reproduced without specifying the source. Hiking on the courts I have neither the time nor inclination, so I call colleagues – journalists and filmmakers to the elementary conscience. Update 2: 7/17/2014 6:20 PM PST. 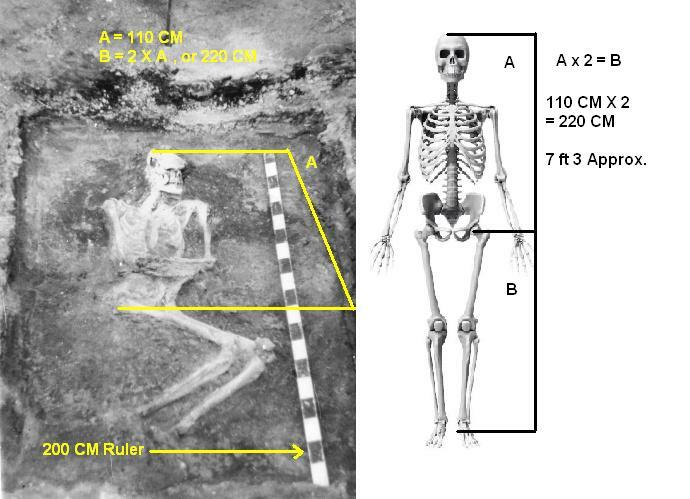 Estimating stature from Above photographs of Don Region skeleton confirms very large size! Notes: Indirect methods of estimating height, weight, and volume of persons. Human Ratios 2.0; Linear & Circumferential Proportions and their Experimental (Approximate!) correlative measures, and further volumetric extrapolations and possible significance….maybe sort of, kind of..! — M.E. Notes, 3/28/15. Chest circumference = ~2x femur length, ~2x Shoulder width, ~2x Cubit length, & ~3x Bicep circumference. Waist circumference = ~2x Neck circumference, & ~3x foot length. Neck circumference = ~1/2 of Waist circumference. Foot length = ~1/3 of waist circumference. Stature = ~3.7 x femur length, or shoulder width, or cubit length. chest girth squared + Waist girth squared x 2.127, divided by 1728, x 55 lbs = Weight. Length of cubit = ~femur, and ~shoulder span. Waist girth = 85% of chest girth, or chest girth minus 6 inches for men. Estimating weight of person: Chest girth X chest girth + waist girth X waist girth = volume of abdomen in cubic inches. Abdominal weight is 47% of total body weight, so multiply by 2.127 to equal total body volume in cubic inches. There are 1,728 cubic inches in 1 cubic foot, therefore divide the result by 1,728. 1 cubic foot of ground beef (approximating human bio-mass!) weighs 55 pounds. 1 cubic foot of water is 63 pounds in weight, but a human being is only 70% water. 1 cubic foot of blood weighs 67 pounds. I have figured that one can estimate within about a 95% degree of accuracy someone’s weight if their chest or waist circumference is known. If it is not known, then a simple measurement of the span of shoulders, femur length, or even stature may be enough to give good approximations as follows: Shoulder width X waist width X depth of chest x 2.127 divided by 1,728, then multiplied by 55. Multiply abdominal volume by 2.127 to find total body volume = 5234.9 cubic inches. 5234.9 cubic inches of total body volume divided by 1,728 cubic inches, or 1 cubic foot = 3.029 cubic feet. 1 cubic ft of ground beef is 55 lbs, so 3.029 X 55 = 166.6 pounds for the man. Height X Height divided by 1 cubic foot, or 1,728 inches, then multiplied by 55 lbs. 5 ft 10 = 70 inches; 70″ X 70″ = 4,900 Cubic inches for total body mass. 4,900 divided by 1,728 cubic inches = 2.836 cubic feet, and X 55 lbs = 156 pounds. This method of Height squared, and then divided to find volume in cubic feet, and mutiplied by the weight of bio-mass, tallies well with the ideal Body Mass Index healthy range of 20 to 25 devised by Quetelet almost 200 years ago and so too does the first method above, if the person’s proportions are approximately symmetrical. UPDATE – Largest Diameter Douglas-fir in Portland! 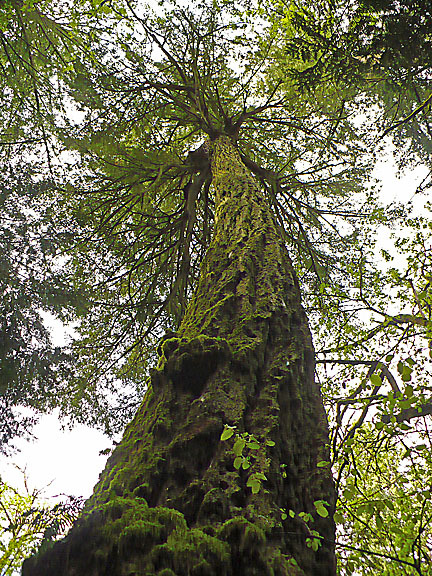 It now appears that the largest diameter Douglas-fir in the city of Portland resides on Powell Butte Nature Park! On “Earth Day” Tuesday, April 22, 2014 I met up with fellow big tree enthusiast, photographer, and outdoors-man Darvel Lloyd and we visited Powell Butte to measure the largest Douglas-fir trees in the park, the “Heritage tree” and “tree of merit” listed in the city of Portland’s tree registry: http://www.portlandonline.com/shared/cfm/image.cfm?id=102686 and http://www.portlandoregon.gov/parks/article/461223. 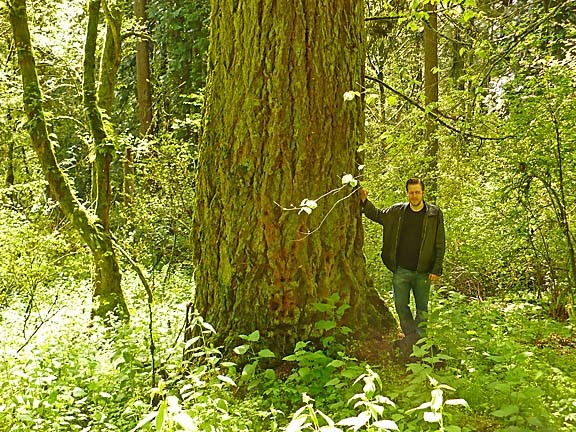 Micah at largest Douglas-fir in Powell Butte Park,4-22-2014, low-res. Photographed by Darvel Lloyd. 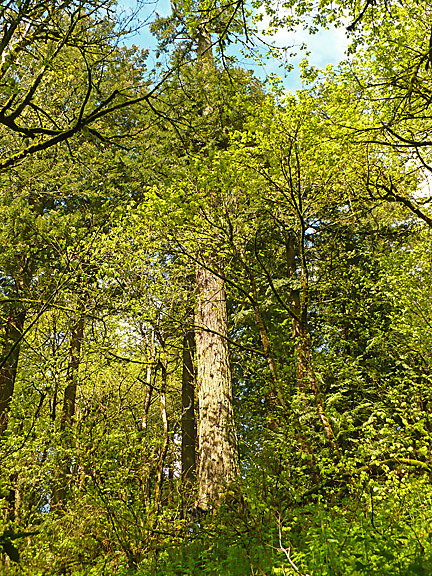 Heritage Douglas-fir Tree, Powell Butte Nature Park, 4-22-2014, low-res. Photographed by Darvel Lloyd. Micah at large fir, off-trail in Powell Butte Park, low-res. Photographed by Darvel Lloyd. Wading through the four foot high stinging nettles, I brought my elastic tape line and we both measured the circumference of several huge trees which ranged in size from about 18 to 20 feet in circumference! The heritage tree is the largest diameter Douglas-fir in the park, and measured about 20 feet 8 inches in circumference at chest height, or 6 feet 7 inches in diameter! The tree was on a bit of an incline, so the measure could be off by a few inches, but for all practical purposes it is a 6 -1/2 foot diameter tree! Both the heritage tree and tree of merit are 160 to 165 feet high to a broken top — suggesting they both may have been 200 feet tall originally before losing their tops! Not far from this little grove of monoliths, and towards the north side of the park there are numerous healthy 150 to 200 foot tall trees.